EPA acting chief Andrew Wheeler went on the defensive today about the agency's regulatory rewrites, maintaining that the Obama administration blew past congressional limits on the agency's power. That approach "jeopardizes the durability of our rulemaking and upsets the balance of power between the three branches and creates uncertainty," Wheeler said this morning. 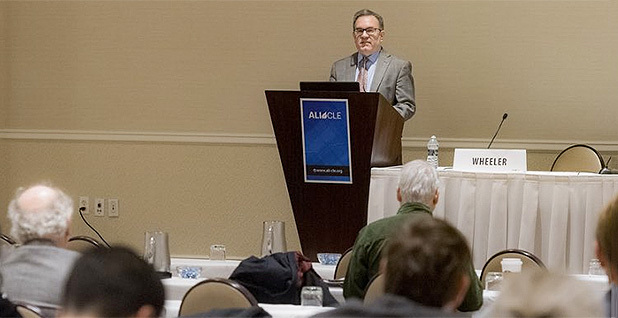 Speaking at an American Law Institute/Environmental Law Institute conference, Wheeler, whom President Trump formally nominated last month for EPA administrator, criticized his predecessors for crafting rules on what he considers shaky legal ground. He outlined the Trump administration's response on three major issues: scrapping the legal underpinning of mercury standards for power plants, replacing the Obama-era Clean Power Plan, and redefining which wetlands and waterways are covered by the Clean Water Act. Wheeler is the latest EPA leader to make public remarks trying to explain and defend the agency's proposal to unwind the legal justification for the Mercury and Air Toxics Standards without gutting the emissions limits themselves. "There's been a lot of misinformation about what we're doing, and I'd like to set the record straight," he said today. Wheeler explained EPA's position that it must revisit the Obama-era determination that regulating mercury, arsenic and other hazardous air pollutants at coal- and oil-fired power plants was "appropriate and necessary." The Supreme Court in 2015 ordered the agency to consider compliance costs for the rule, and Trump officials say the Obama administration's response was inadequate. EPA is now proposing to strike the "appropriate and necessary" finding but leave the actual emissions limits in place. Still, it has solicited public comment on scrapping the regulation altogether. "We are following a course which threads the needle between keeping the standards in place while revising the supplemental cost finding," he said. General Counsel Matt Leopold made similar comments yesterday, as did air chief Bill Wehrum last month (E&E News PM, Feb. 7). Wheeler also expressed frustration today about criticism that EPA is rolling back President Obama's plan to cut greenhouse gas emissions from power plants. The Clean Power Plan likely would not have held up in court, he said. "We're constantly being accused of rolling back the Clean Power Plan, but the Supreme Court issued a historic stay on the Clean Power Plan," he said. The proposed replacement, the Affordable Clean Energy rule, "operates within the four corners of the Clean Air Act" and will be upheld in court, he said. He also defended EPA's new proposed definition for what counts as a water of the United States, or WOTUS, subject to federal oversight, and he criticized the Obama administration's rule as a power grab to centralize decisionmaking in Washington, D.C.
"They claimed it was in the interest of water quality, but it was really about power," he said. The Obama administration definition is still in effect in 22 states, thanks to a jumble of lawsuits across the country. Wheeler argued that the proposed interpretation — which would sideline Obama-era protections and remove certain waterways protected during the George W. Bush administration — will end the "confusing regulatory patchwork and establish national consistency." The proposal will appear next week in the Federal Register, Wheeler said. States and environmental groups plan to litigate all three EPA proposals once they're finalized. They say the agency's rollbacks not only flout administrative rules but also fail to meet requirements under the Clean Air Act, Clean Water Act and other bedrock laws. Wheeler, confirmed as EPA's deputy administrator in April, has been the agency's acting chief since July after Scott Pruitt stepped down under a crush of ethics allegations. Now nominated for the top job, Wheeler's nomination was approved by the Senate Environment and Public Works Committee earlier this week. The full Senate is expected to take action on his nomination soon after it confirms Bill Barr for attorney general. Wheeler said he underwent the longest confirmation process ever for a deputy administrator at EPA. He also mentioned that he recently had lunch with Bob Perciasepe, the former Obama-era deputy EPA chief, who told Wheeler that he had surpassed his record of being the longest-serving acting administrator. "So I've already set two records," Wheeler said, noting that it looks like his nomination process for administrator is going a little faster. Wheeler took a few questions from the crowd after his speech, including one about budget cuts for EPA. He said Congress has given the agency more money than the president requested the past two years. "I think we have the funding that we need to get the job done," Wheeler said, adding that agencies need to work within the budgets they have and make smart use of their resources. Wheeler also said EPA will have a new human resources director starting in March. He said he is worried about retention of employees at EPA, saying 40 percent of the workforce will be eligible to retire over the next five years. He added that younger workers are less likely to stay with the agency over the long term compared with their older counterparts. "So we have to figure out a way of attracting the best talent and keeping the best talent, that we don't lose the technical expertise we have, and we need to get our job done," Wheeler said. "That actually is my bigger concern. I think the funding is fine." What also could affect EPA's workforce is another government shutdown. Federal funding is set to run out at the end of next week as lawmakers look to resolve an impasse over Trump's border security demands. EPA used carryover funds to stay open for the first week of the last partial government shutdown. But the agency closed by that week's end, furloughing roughly 13,000 of its employees and stalling some of its regulatory work. Asked after his speech whether he is worried that another extended funding lapse could hinder his regulatory goals at the agency, Wheeler didn't seem concerned. "We will get by," he said. "Hopefully, that won't happen."